The Linear System Editor of 20-sim allows you to enter or edit linear time- invariant models. It supports continuous and discrete-time single input / single output (SISO) systems with and without time delay. 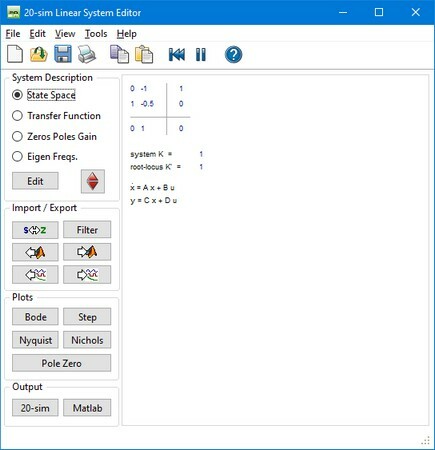 You can open the Linear System Editor from the Tools menu of the 20-sim Editor or by clicking Go Down on the Linear System model. A linear system can also be the result of a linearization operation in the 20-sim Simulator. Some menu items are of particular importance. • File: You can use the file menu to open, import and export linear systems. • Edit - Tolerance: You can specify the tolerance for transforming between state-space and transfer functions. • Edit - Reduce System: You can reduce the system order by pole-zero cancelation. The distance between poles and zeros to match for cancelation is given by the Reduction Tolerance. • View: the view menu can be used for holding, clearing and refreshing plots. • Pressing the Edit button will open a dialog for editing the linear system. Each description (State Space, Transfer Function, Zeros Poles Gain or Eigen Frequency) has a special dialog and can be used to specify continuous-time and discrete-time systems. • In the 20-sim Simulator, out of an existing (non-linear) model a symbolic linear-system can be derived by means of linearization. This means that the relevant model parameters are preserved in the Linear System and the parameters button can be used to change parameters. • Pressing the s<->z button will transform a continuous-time linear system into a discrete-time linear system and back. • Pressing the Filter button opens the Filter Editor, where a filter can be designed. This filter can then be combined with the current linear system or replace the current linear system. If the linear system is a discrete-time system, the designed analog filter is automatically transferred into its digital equivalent. • The button is only active when a Linear System has been imported through linearization. Clicking the button will import parameters from the simulation. • The button is only active when a Linear System has been imported through linearization. Clicking the button will export the current parameters to the simulation. • Clicking the 20-sim button will export the linear system as a new 20-sim submodel. • Clicking the Matlab button will export the 20-sim Linear System to a Matlab m-file. If the Linear System is symbolic, all parameter relations are preserved.